ByWater Solutions, an open source community supporter and the US’s forefront provider of Koha (www.koha-community.org) support, announced today that the Plum Creek Library System (PCLS) is now live on their installation of the Koha integrated library system. The Library’s Koha installation went live earlier this month, and ByWater Solutions will be providing ongoing support and hosting services for them. The Plum Creek Library System is made up of 26 member libraries and has a collection of over 730,000 items. Their public catalog can be searched at http://opac.plumcreeklibrary.net. The Plum Creek Library System is a federated regional public library system in which each library is funded locally, has its own library board, selects its own materials and retains local control. Each library must maintain a minimum level of financial support to belong to the system. As a result, the system earns revenue from state and federal sources which is used for the benefit of all members. Abu Dhabi recognizes Brill’s extensive publishing program in Middle East and Islamic Studies with the “Sheikh Zayed Book Award” for publishing and distribution. The prize awards Brill with UAD 750,000, (appr. EUR 150,000) which will be used to both establish a fellowship and invest in innovative future publishing projects. Brill is honored to accept the “Sheikh Zayed Book Award” for publishing and distribution excellence in Middle East and Islamic Studies. Brill will receive UAD 750,000, which will be used to establish a fellowship for students and scholars, and to invest in future innovative publishing projects to further Brill’s contribution to the research and study of literature, culture, history and social science in Middle East and Islamic Studies. Brill was awarded the prize based on an evaluation of its publishing activities in Middle East and Islamic Studies over the past three years. Major works include the Encyclopaedia of Islam, which, in its third edition, serves as the preeminent work in the field, and the award-winning Encyclopedia of Jews in the Islamic World, both of which are available in print and online. The publishing program also covers topics such as Islamic manuscripts, Islamic art, social science, history, culture and gender studies. Recently, Brill digitized 110,000 Middle Eastern manuscripts in collaboration with Leiden University Libraries to publish Middle Eastern Manuscripts Online 1, the first of an extensive online primary source collection. With these recent efforts Brill continues a long tradition as a publishing house with a successful program in Middle East and Islamic Studies; some of Brill’s landmark publications in this area date back as far as the 18th century. Founded in 1683 in Leiden, the Netherlands, BRILL is a leading international academic publisher in the fields of Ancient Near East and Egypt, Middle East and Islamic Studies, Asian Studies, Classical Studies, Medieval and Early Modern Studies, contemporary History and History of War studies, Biblical and Religious Studies, Slavic Studies, Language & Linguistics, Biology, Human Rights and Public International Law. With offices in Leiden and Boston, BRILL today publishes more than 175 journals and around 600 new books and reference works each year. All publications are available in both print and electronic form. BRILL also markets a large number of research collections and databases with primary source material. The company’s key customers are academic and research institutions, libraries, and scholars. BRILL is a publicly traded company and is listed on Euronext Amsterdam NV. For further information please visit www.brill.nl. LISWire: Educating Students about Nuclear Science: Mousetraps and PingPong Balls? 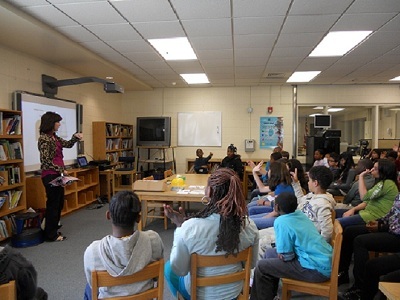 “Do power plants really use mouse traps and Ping-Pong balls?” Just one of the questions students who celebrated National Engineers Week got answered by attending the school presentation of Nuclear Power: How a Nuclear Power Plant Really Works! sponsored by RCS Nuclear Corporation. Amelia Frahm, author of the children’s picture book, described a fission chain reaction using a metaphor of Ping-Pong balls and mouse traps in order to help children understand how energy is produced in a nuclear power plant. RCS Nuclear donated Frahm’s book to Charlotte, North Carolina elementary schools and sponsored the author reading. As a supplier of nuclear and related engineering personnel, RCS Nuclear likes to encourage young students to become engineers. “These students are the future for industries we supply engineers to, and it is the company’s responsibility to prepare them now,” said Carlos Garcia, founder of RCS Nuclear. Since its release in December, Frahm’s children’s book explaining nuclear power plants and the related school presentation she has implemented have been used by corporations like RCS Nuclear to focus attention on National Engineers Week, and by schools like Van Vleck Elementary in Van Vleck, Texas who used the program to kick off National Nuclear Science Week. Frahm’s school presentations helped celebrate in a manner that grasped the attention of elementary and intermediate students. “I try to engage children using concepts they understand and find entertaining, like when I ask what Chubby does on his day off, he goes fission,” said Frahm. In attendance at Frahm’s Steele Creek Elementary book reading in Charlotte were five sessions of 50 students; in total, approximately 250 fourth and fifth graders. Prior to the reading, the students were asked if they knew what nuclear engineers did or how nuclear energy was created. Students could not give an answer; however, they listened carefully as they learned how a nuclear plant works from the point of view of a lab rat, a blue bird, and a fat cat, who are characters in the book. Then they laughed as they enjoyed a video created by the author, which demonstrated the mouse trap and Ping-Pong ball fission chain reaction. More information about Frahm's school program and contact information to schedule an author book reading may be found on the link School Programs at NutcrackerPublishing.com. Nuclear Power: How a Nuclear Power Plant Really Works! costs $9.95 and is available from the publisher, Barnes & Noble bookstores, online at Amazon.com, and at other bookstores. RCS Nuclear is a Trade Name for RCS Corporation. Ranked the #1 Fastest Growing New Small Business in America by Entrepreneurmagazine, Since 1994, RCS Corporation has provides Professional Staffing Services to the Nuclear and Energy Industries throughout the United States and Internationally. Nutcracker Publishing Company was founded in 2001. The company publishes children's books that educate, entertain, and make it easier to establish a dialogue between children and adults about difficult subjects such as cancer and nuclear power. Information on educational programs for schools and other organizations can be found at the company’s website. Nutcracker Publishing Company is based in North Carolina. Brill and the Frick Collection have signed an agreement to digitize c. 3,300 historical art sales catalogues from the Frick Art Reference Library for Brill’s publication Art Sales Catalogues 1600-1900 Online (ASCO). The Frick Art Reference Library is one of the largest repositories of auction catalogs and provenance information in North America. Its collection consists of more than 90,000 catalogs, with an annual acquisitions rate of 1,500. Catalogues from more than 1,000 auction houses in Europe, Australia, and the Americas, ranging in date from the eighteenth century to the present, are represented in the collection. Brill’s Art Sales Catalogues Online (ASCO) database, originating from the IDC imprint and now containing almost 30,000 sales catalogues from the period 1600 to 1900, will be supplemented by catalogues from the Frick library. A selection of c. 3,300 historical catalogues, not yet available in the existing database, will be added in yearly batches in the coming 5 years. These supplements will enrich the database with many unique and rare items. This not only makes these valuable texts available to a larger community of scholars, it also helps to preserve these catalogues. The first installment of c. 700 catalogues is expected at the end of 2012/early 2013. The Frick Art Reference Library was founded in 1920 to serve “adults with a serious interest in art,” among them scholars, art professionals, collectors, and students. The Library’s book and photograph research collections relate chiefly to paintings, drawings, sculpture, and prints from the fourth to the mid-twentieth centuries by European and American artists. Known internationally for its rich holdings of auction and exhibition catalogs, the Library is a leading site for collecting and provenance research. Archival materials and special collections augment the research collections with documents pertaining to the history of collecting art in America and of Henry Clay Frick’s collecting in particular.